For a bustling, noisy and popular harbor place, here’s a nice detail: All sweets are still homemade. So don’t miss the local babà, a giant donut smothered in cream. 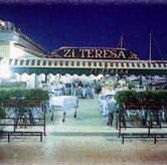 Zia Teresa (who else) cooked for local fisherman, and in 1916 the daily routine turned into business. Food? What else? Sit at a table overlooking the port (book in advance) and order bruschetta, penne all’arrabbiata and orata all’acqua pazza (roasted bream). Or go all-seafood: antipasti, spaghetti alle vongole, cozze (clams), and the day’s fresh catch, announced loud and clear by a hustling wait staff. There are also some backup turf dishes. Michelin and Gambero Rosso have always tipped their hat to Zi’, which hasn’t really made the seafood taste any better (they had that part down), but has raised per head prices to a daunting €80 and up.